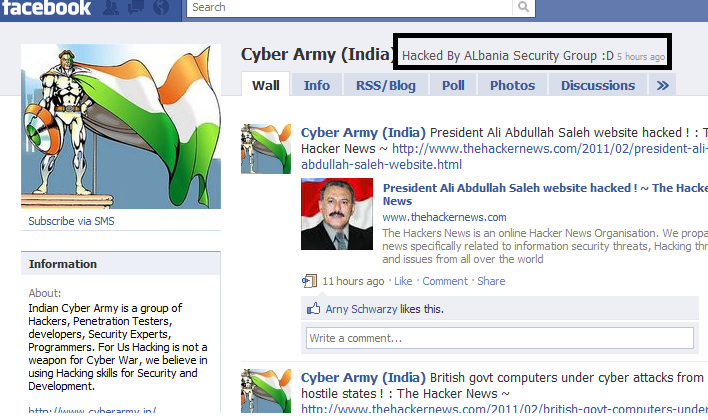 TheHackerNews and CyberArmy(India) Facebook Pages Hacked By Albania Security Group ! Facebook Pages Hacked By Albania Security Group ! Albania Security Group !! The Group is created by 4 members !! hacker twilight ,akrepi hacker , BombRun , WarBot ! They have hacked 300 facebook fan pages in 1 day ! No issue for us, Because If Facebook Founder, Mark Zuckerberg's Facebook Fan Page can be Hacked , then no-one is secure on Facebook ! Thanks to Albania Security Group, They prove that Security is really from you !! I read the script these guys used to hack us... and really wanna appreciate, they did damn awesome job. Update : Both Facebook Pages Successfully Retrieved By Owner Of "The Hacker News" , - Security is From you ! !